DMCC Free Zone is a beautiful mixed use waterfront development located in the heart of Dubai close to the Marina and Palm Jumeirah. It facilitates both business and community living, by offering freehold commercial, residential and retail property for sale and lease in over 68 high rise towers and in a selection of other low and medium rise properties. 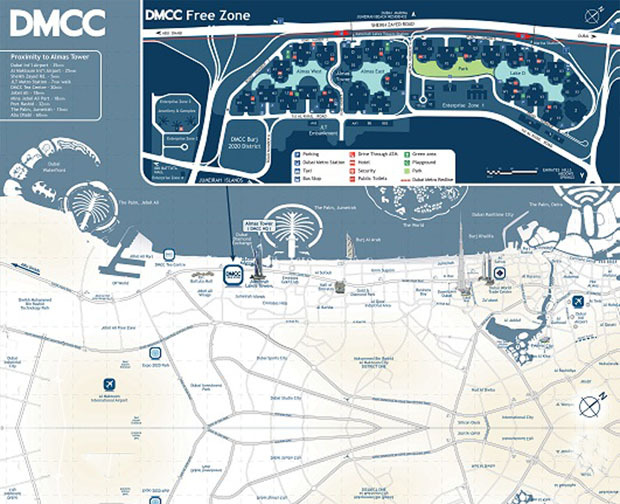 DMCC is the Government of Dubai Licensing Authority for the Free Zone and offers seamless business solutions for those looking to set up, license and operate a company in Dubai, with its reliable and robust platform enabling companies to establish and thrive within the Jumeirah Lakes Towers (JLT) community. From multinational organisations and major regional industry participants, to small and medium sized businesses and start-up companies the DMCC Free Zone has over 10,000 member companies operating within JLT and enjoying its facilities and services.